The Sony E16mm f2.8 Lens is a light, low-profile pancake lens that fits comfortably on Sony's APS-C E-mount cameras, whilst maintaining the slimline look and slipping easily into your pocket. 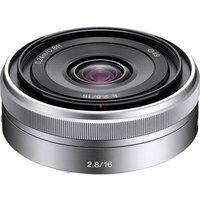 Great for everyday shooting, this 16mm lens contains high-quality optics including a 7 blade circular aperture for beautiful defocus effects and an aspheric surface for excellent contrast and sharpness. The lens features direct Manual Focus with a non-rotating focus ring during Auto Focus, ideal for precise, comfortable adjustments. The Sony 16mm f2.8 Lens is compatible with the optional VCL-ECU1 ultra-wide converter and optional VCL-ECF1 fisheye converter.